This is a demo released to promote Oh No! More Lemmings. It includes two levels from Oh No! (different ones depending on version and platform) and two new exclusive Christmas-themed levels. 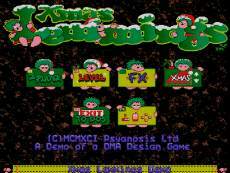 The levels feature snowy landscapes, snowmen, festive lights, Christmas songs as background music and the Lemmings dressed in Santa hats and coats.